And so it begins. The summer movie season, or Geek Christmas, gets underway this weekend, and boy is it not messing around this time. Our first big movie of the season is a really good contender to be the top film of the year, and has a shot at some records. This weekend's release of The Avengers is the culmination of what might be one of the most ambitious projects in film history. What started a little over four years ago with the release of Iron Man comes to fruition, as the film collects four franchises worth of superheroes together for one gigantic battle for the world. It's sort of the Ocean's Eleven of comic book movies, but with more of the Earth exploding. 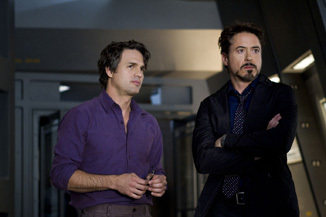 In addition to the aforementioned Iron Man (Robert Downey Jr), we also have the stars of last year's comic book one-two punch, Thor (Chris Hemsworth) and Captain America (Chris Evans), The Hulk (recast for a third time, with Mark Ruffalo) and the Professor and Mary Ann of The Avengers, Hawkeye (Jeremy Renner) and Black Widow (Scarlett Johansson). Also linking the films together are Nick Fury (Sam Jackson) and the film's main villain Loki, plus many other assorted minor characters who, quite frankly, matter to about 12 nerds out there. The remarkable thing here is that they were able to get everyone together at the same time (some of these people have actual careers outside this) for a price that didn't make this The Most Expensive Movie Ever™.